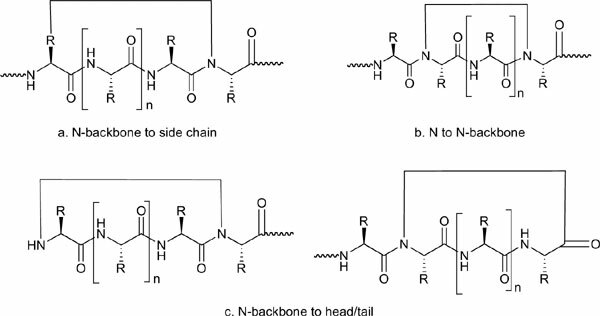 Backbone-cyclized peptides and peptidomimetics integrate the biological activity and pharmacological features necessary for successful research tools and therapeutics. In general, these structures demonstrate improved maintenance of bioactive conformation, stability and cell permeability compared to their linear counterparts, while maintaining support for a variety of side chain chemistries. We explain how backbone cyclization and cycloscan techniques allow scientists to cyclize linear peptides with retained or enhanced biological activity and improved drug-like features. We discuss head-to-tail (Cterminus to N-terminus), building unit-to-tail, building unit-to-side chain, building unit-to-building unit, and building unit-to-head backbone cyclization, with examples of building blocks, such as Nα-(ω- thioalkylene), Nα-(ω-aminoalkylene) and Nα-(ω-carboxyalkylene) units. We also present several methods for recombinant expression of backbone-cyclized peptides, including backbone cyclic peptide synthesis using recombinant elements (bcPURE), phage display and induced peptidyl-tRNA drop-off. Moreover, natural backbone-cyclized peptides are also produced by cyanobacteria, plants and other organisms; several of these compounds have been developed and commercialized for therapeutic applications, which we review. Backbone-cyclized peptides and peptidomimetics comprise a growing share of the pharmaceutical industry and will be applied to additional problems in the near future. Keywords: Backbone cyclization, Cyclization, Cycloscan, Peptides, Peptidomimetics, Protein-protein interactions, Therapeutic. Keywords:Backbone cyclization, Cyclization, Cycloscan, Peptides, Peptidomimetics, Protein-protein interactions, Therapeutic. Abstract:Backbone-cyclized peptides and peptidomimetics integrate the biological activity and pharmacological features necessary for successful research tools and therapeutics. In general, these structures demonstrate improved maintenance of bioactive conformation, stability and cell permeability compared to their linear counterparts, while maintaining support for a variety of side chain chemistries. We explain how backbone cyclization and cycloscan techniques allow scientists to cyclize linear peptides with retained or enhanced biological activity and improved drug-like features. We discuss head-to-tail (Cterminus to N-terminus), building unit-to-tail, building unit-to-side chain, building unit-to-building unit, and building unit-to-head backbone cyclization, with examples of building blocks, such as Nα-(ω- thioalkylene), Nα-(ω-aminoalkylene) and Nα-(ω-carboxyalkylene) units. We also present several methods for recombinant expression of backbone-cyclized peptides, including backbone cyclic peptide synthesis using recombinant elements (bcPURE), phage display and induced peptidyl-tRNA drop-off. Moreover, natural backbone-cyclized peptides are also produced by cyanobacteria, plants and other organisms; several of these compounds have been developed and commercialized for therapeutic applications, which we review. Backbone-cyclized peptides and peptidomimetics comprise a growing share of the pharmaceutical industry and will be applied to additional problems in the near future.